Is time speeding up for me? It’s been just three years – the blink of an eye – since Theory of Knowledge concluded its last curriculum review, and once again the wheels of revision are moving into motion. Soon a group of our TOK colleagues will gather to give our beloved course its next level of improvement. I’ve been asking myself, “What changes would I like to see myself, at this point, in TOK?” And the answer comes to me, emphatically. I don’t know what goals are being set ahead for this revision, but I’ll share my own hopes here in case others find them interesting for their own thinking. It seems to me that this group has a different challenge ahead from that of the last group. Their 2013 Guide added impressively to TOK – they added new topics to ways of knowing and areas of knowledge and produced the new structure of the knowledge framework. The changes were significant in giving a broader vision of knowledge, one that appreciates (e.g. intuition) contemporary cognitive sciences and has potential in two new areas of knowledge to explore cultural variability in knowledge more extensively. But now….I hope that the upcoming review group will clarify and shape the current Guide so that the ideas and their connections are more readily accessible to teachers and students. I hope that they will centre the course overtly and explicitly on inquiry and thinking skills. It would be useful to clarify the key concepts, bring them to the surface in the Guide’s presentation, and then use them to explain the course. It would be useful to centre the ways of knowing more explicitly on inquiry and critical thinking in constructing knowledge, to bridge from the key concepts to the areas of knowledge. It would be useful to simplify the knowledge framework, show it emerging more explicitly from the rest of the TOK course, and shift from description to inquiry. 1.It would be useful to clarify the key concepts, bring them to the surface in the Guide’s presentation, and prepare them for use in a questioning and analytical course. It is pure TOK to suggest that the central concepts of an area create the path for exploration of its knowledge. To make the Guide more helpful, in my opinion, the key concepts need to be honed to create a clear path for our course and prepared for active application in thinking critically. Although there are many candidates for the role of “key concepts”, I would lean toward selecting a small number of highly useful ones, presenting them prominently, and then using them. I suggest the following five. acknowledge that there are different possible conceptions of knowledge in a course bearing the name “Theory of Knowledge”. At the very least, we benefit from sketching in knowledge in terms long familiar in the TOK community – knowledge based on direct familiarity, knowledge in the form of skills, and knowledge in the form of knowledge claims. suggest the construction of knowledge to be a response to knowledge questions, not just in its initial generation but all along in its continued development. The section on personal and shared knowledge in the present Guide attempts a solution to past problems in assessment. At one time too many student essays showed almost nothing of the student’s own experience of gaining and evaluating knowledge, so in TOK we tried to emphasize “the student as knower”. Alas. The pendulum swung to the other extreme, toward essays in which too many students barely pushed their thinking beyond personal anecdote. Alas again. Still, in the present Guide, the worthy attempt to arrest the swing of the pendulum seems to me somewhat overworked and static. Wouldn’t the distinction benefit from being presented with greater stress on the flow of knowledge between individuals and groups? I would love to see knowledge treated as more dynamic, as an active exchange – to be caught in the process and examined. If knowledge is shared, who is sharing and how? A shift in emphasis to understanding and critiquing communication of knowledge prepares better for analysis of knowledge claims, perspectives, and the methods of building knowledge in different areas. 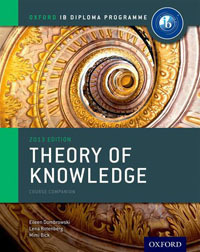 This central concept of the TOK course is named well in the current Guide. But whatever it have been called, now or in the past (problems of knowledge, knowledge issues), teachers have always asked for further clarification. I like the section in the Guide on knowledge questions, but hope that further support materials will emerge for this review that give lots and lots (and lots and lots) of examples. Did the group who named this concept realize fully what a good thing they did for TOK? Using “knowledge claims” as the central term gets us launched. If we want to investigate the flow of knowledge, and the competing assertions and interpretations so often involved, we could scarcely do better than look at what people claim they know. The term immediately presents knowledge claims as human and questionable, and immediately brings in associated ideas of communication. I would really like to see this term (or its equivalent) developed in the Guide. “Justifications” still appears at the top of the course objectives, but in the most recent iteration of the Guide it is not used in vocabulary and does not appear in the marking criteria. It’s not the word that matters, of course, but the concept, so that the term “support” or something equivalent might do just as well. But in my opinion, TOK needs this conceptual tool – a word well understood and consistently used — for analyzing and evaluating knowledge claims. TOK also needs the concept “justifications” (or its equivalent) in order to explain well the flow in both directions between personal and shared knowledge (and within shared knowledge between groups); it needs such a term to consider what the ways of knowing contribute to everyday knowledge and areas of knowledge; it needs the term in order to be able to compare the methodologies of different areas of knowledge. Justification is key to TOK. If people are asserting knowledge claims, why do they accept them and why might they expect others to agree? What are their reasons? If they are citing memory as their reason for accepting claims, then of what uncertainties should students be aware? If they are referring to evidence, then what are the quality and quantity of that evidence? If they are offering logical argument, then is the reasoning sound? If they are citing sources, are the sources appropriate and reliable (relevant to student research, relevant to understanding climate change scientific consensus vs denial)? It’s only by looking at the justifications – the nature and quality of the justifications — that we can be analytical, appreciative, and thoughtfully critical of knowledge, and specifically of knowledge claims. Moreover, it is largely by being aware of good, bad, and better justifications for accepting knowledge claims that students can be effectively reflective and self-monitoring as they build their own knowledge. I would really like to see this term developed in the Guide. Even though the concept of perspectives is prominent in the aims, objectives, and marking criteria, and seems important in the section “Fostering international-mindedness” (page 5), it appears in the rest of the present Guide in a very sketchy manner. It lies largely buried: it appears in the middle of a paragraph on page 19, it hovers over comments on points of view and interpretation in the sections on knowledge questions and ways of knowing, often unnamed, and it appears only once in the knowledge framework (and is there associated just with bias). Even that lovely introductory section on “TOK and international-mindedness” (page 11) makes only a glancing reference to this central concept of the course aims and doesn’t use its historical survey to suggest the ongoing wealth and diversity of perspectives that give knowledge much of its current vitality. theoretical perspectives within the sciences: theories illuminate and connect certain features of the subject matter to give understanding and coherent explanation, but at the same time may leave other features in the shadows. cultural perspectives of groups: a cultural worldview integrates into a coherent and mutually supportive whole a body of beliefs and practices so that people can make sense of the world — though that “sense” may differ from another group’s. political/ideological perspectives: ideological views unite their communities with a whole package of assumptions, values, and knowledge claims, and also with responses to knowledge claims and people who confirm them or conflict with them. The cognitive sciences illuminate the extent to which we construct our knowledge within our theoretical or communal bubbles (shared knowledge), accepting the knowledge claims and justifications of the group and often resisting change (confirmation bias). Using the concept of perspectives as the shared view of a knowledge community can help teachers and students to recognize the influence of what we already think on what we notice and how we interpret. A perspective, in these terms, is not just “bias” – with all its negative connotations. Yes, it can certainly create barriers to openness, communication, and critical thinking – but possibly less so for students who, through TOK, become more self-aware. Moreover, our diverse perspectives enrich knowledge with multiple possibilities for understanding our world. the implications for further acceptance and action of holding a given perspective. If the concept of perspectives is developed in TOK into an appreciative and analytical tool, it could give students a better understanding of knowledge claims in everyday life and areas of knowledge, since it provides a way of coming to grips with interpretations and methods. It might give them better support, too, for the TOK assessment tasks, which expect awareness of perspectives. Moreover, as an analytical tool, it also supports class discussions involving differences in opinion and worldview. Analysis gives a way into discussion – it opens a door to make cross-perspective communication more comfortable for students. My suggestions here regarding the treatment of perspectives are really all about bringing to the surface a concept that is already in the course, buried, so that it becomes a thinking tool ready to be applied in thinking and discussing knowledge. By way of further explanation of how I see perspectives fitting the ideas of the current course, I offer a one-page picture I worked out last year. It’s on my Activating TOK blog: “Visualizing the TOK course: a graphic overview”, October 20, 2015. These five concepts strike me as the essential ones we need for building the TOK course. I suggest then using them in talking about ways of knowing and areas of knowledge. Running the key vocabulary consistently throughout the treatment of further course ideas makes the course more internally coherent and makes its connections more immediately evident to a reader. 2. It would be useful to centre the ways of knowing more explicitly on inquiry and critical skills in constructing knowledge, to bridge from the key concepts to the areas of knowledge. Personally, I think the inclusion of the four new WOK was one of the best moves made by the last curriculum review group: it enlarges the concept of knowledge, brings it up to date (intuition as treated by the cognitive sciences is indispensable! ), and pushes teachers to treat the dynamic interplay of these ways. Yet to me the section on ways of knowing really needs to be tilted more toward questioning and inquiry, and more toward emphasizing the critical skills that come out of using our ways of knowing with awareness and care. Personally, I would make three main modifications – less for content than for clarity and emphasis on TOK skills. How does this WOK contribute to our knowledge? How does it interact with other WOK in the process? What kinds of knowledge claims is this WOK used to justify? To what extent can we learn to use this WOK with awareness? How can we use it thoughtfully and critically to build the most reliable knowledge we can? b.I’d present the WOK as interconnected and essential – all of them! Couldn’t the 8 WOK be presented differently visually, so that they are not seen as 8 separate and identical-looking blocks of text? This is not a superficial issue: the linear march of paragraphs that present background information, with only hints of knowledge questions, prompts practical questions such as “How many of the 8 do we have to cover?” Yet covering information is not an aim of TOK. Myself, I had interpreted the addition of 4 new ways of knowing to the TOK course not as an addition of material to be covered but as an improved identification of the ideas we need to discuss the construction of knowledge. The 8 do not demand equal class time for students to recognize them, reflect on them critically, and begin to apply them with greater care. The 8 do not play identical roles, nor do they work together always in the same blend of dominant colours. But seems to me that every one of the 8 has to come into class discussions somehow. Indeed, even before imagination, for example, was named a “way of knowing”, it had had an important role in discussions of creativity in knowledge, just as memory was essential in considering knowledge the past. c. I’d strongly connect “ways of knowing” and “justifications” – and maybe even replace the former with the latter as the umbrella concept. Although, as I commented earlier, the concept of “justifications” is not treated in the Guide, it’s the very concept that links the ways of knowing to knowledge claims and invites critical investigation. It’s at the heart of the connection between ways of knowing and areas of knowledge. IF the concept of “justifications” is not going to be developed in the next Guide, then I think that the ways of knowing at least have to be presented with leading knowledge questions on how we can use them critically. The treatment of ways of knowing in TOK is the ideal place to give students awareness of fallacies involving reason, emotion, and language, and cognitive biases involving intuition – at the very least! It’s the perfect place to consider how sense perceptions and memory actually work compared with how they seem to us to work, or the role of faith — or trust in a source considered reliable — in accepting knowledge claims. The ways of knowing are what we use to build both knowledge in “the wider world” (as the TOK aims have it) and the areas of knowledge – and only a critical discussion of them prepares students to evaluate their use in the knowledge claims of everyday life (media, politics!) and to appreciate their roles in the methodologies of the areas of knowledge! And here’s another idea – though I’m tentative about it. In order to shift away from an emphasis on description and material to be covered – and toward the development of thinking skills and engagement with the world — could we abandon the term “ways of knowing” altogether? As our umbrella concept, could we use instead the concept of “justifications”, to which the present ways of knowing give rise, and under whose umbrella the WOK could be dissolved and reconstituted? This change has the potential to move active critical exploration more to the centre of the course and to give students vocabulary and an approach to discussing knowledge more analytically. Worth considering? 3. It would be useful to simplify the knowledge framework, show it emerging more explicitly from the rest of the TOK course, and shift from description to inquiry. A knowledge framework is a very good idea for bringing out essential characteristics of areas of knowledge and setting up comparisons across the areas of knowledge, and a lot of good work has gone into the present version. However, for accessibility to teachers and support for inquiry, I think it would benefit from editorial revision. a. I’d integrate the rest of the course more explicitly into the knowledge framework. This is the same point I’ve made earlier – the advantage of using the key concepts and ways of knowing more overtly and extensively in the framework. This is largely a matter of revising language but also involves a shift in emphasis. b. I’d recast the knowledge framework so that each part is opened up by a question rather than named by a heading. If we want to frame the course with inquiry and to present the development of knowledge as response, then it would be reasonable to employ in our own framework – that is, to frame our framework — the kind of knowledge questions that we say are central to the course. c. I’d simplify the entire framework. So much work by the previous curriculum review group has obviously gone into the knowledge framework that it may seem unappreciative of me to suggest that it goes too far toward descriptive coverage in the manner of a delivery course. But I do think that it would better to lighten up — to ask questions in ordinary language and open up space directed toward discussion — than to provide quite so much worked-out detail on specific areas of knowledge. I have some further comments on a simplified framework on my Activating TOK blog: “Simplifying the knowledge framework, entry level”, September 28, 2015. ) Basically, I would like to see the framework easy for teachers and students to grasp and use to get their discussions launched, and easy for students to recall to hold ideas together in overview, even long after they have completed TOK. How do ways of knowing contribute to the methods of this area? How do they contribute to the creation, evaluation, and communication of knowledge? Is the knowledge in this area mainly in the form of knowledge claims, or are there other kinds of knowledge created and communicated? What kinds of justifications characteristically support knowledge claims in this area? In what ways does the subject matter of this area affect the justifications accepted as convincing? How do perspectives (e.g. cultural, theoretical, political) influence the construction of knowledge in this area? (assumptions? values?) Is this area characterized by a single dominant perspective at a time – such as a dominant theory or interpretation – or do differing perspectives typically exist at the same time? For each of the specific areas of knowledge, I would replace the assertive bullet points with knowledge questions that open up discussion. Knowledge questions, while staying open, could be crafted to elicit the ideas in the bullet points. And — I would most definitely scrap the section of knowledge questions treated as an add-on! Knowledge questions are not an add-on. They are the frame itself! I would like to see the “knowledge framework” re-conceptualized to become the “framework for inquiry into knowledge”. Yes, I hope a leaner, clearer TOK course emerges from the curriculum review that is soon to begin. I hope that the review trims to the key concepts and uses them to build a course that holds together conceptually. I hope that the review strengthens the forward thrust of inquiry into knowledge questions, and shifts the course more overtly toward analysis of knowledge claims, justifications, and perspectives in the active flow of knowledge. I hope that the review takes the substantial TOK course that we presently enjoy, and shapes it to emphasize more fully the skills of thoughtful questioning and investigation that our students need if they are to become, as we hope, global citizens. Eileen Dombrowski. January 26, 2015. This entry was posted in IB Theory of Knowledge and tagged critical thinking. Bookmark the permalink. trimming key concepts is a welcome step if materialized. interdependence of AoKs, diversity of WoKs should be open for evaluation through political, economic, cultural and social point of view and can be lucidly conveyed to examiners. assessment thrust can be on the skills of analysing and evaluation of key aspect of the theme -with clear explicit evidence of reaching on to a fully justified conclusion ; for this simplification of assessment is needed by reducing heavy weights on language of the text to clarity of thought progression and the mix of critical evaluative structure of essay. over all constant reading and handling of TOK delivery can remove the burden from teachers to impart and students to explore further research in colleges ; aim of TOK. It is a bridge. As someone working the 2020 curriculum as part of the review team I am happy to say that the ideas raised are very much under discussions. Hello Richard, I would be very interested to know which of the many ideas presented are under discussion, there´s so many avenues for development!